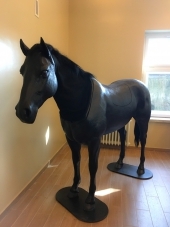 On 28 of March, 2018 council of the Lithuanian University of Health Sciences made the decision to establish Center of Veterinary Medicine Simulation in LSMU Veterinary Academy Faculty of Veterinary Medicine. 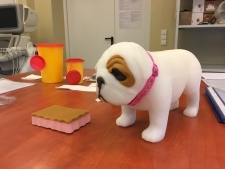 The purpose of the Center is to enable the continuous training of practical skills in veterinary medicine by using veterinary medical simulation methods. Veterinary medicine simulation center is the place, where students can learn practical skills without doing any harm to the animal, because artificial patients or their parts are used in the learning process (manikins, etc.). Each student can arrange their own individual practical session schedule, enabling them to study at their own pace. Practical skills are developed in a safe and stress less environment, where there is no risk of harming animals. Students might make mistakes and learn from them, which is an important part of the learning process. After getting some practical skills at the center students become well prepared for the clinical studies, internships and work. Laboratory workshops on practical skills and clinical subjects also take place at the Center of veterinary medicine. Hand wash and hand rub. Needles, intravenous catheter and syringes. Canine intravenous leg training model. 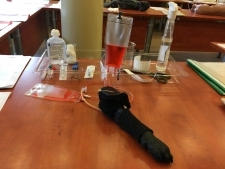 Intravenous fluid therapy set up. 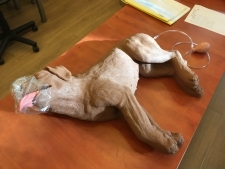 Canine breath heart sound BHS simulator training model. Equine palpation/colic simulator with Equine neck venipuncture/intramuscular injection. Blood morphological and biochemical tests. For booking, please contact vetsim@lsmuni.lt, at least 2 days before the scheduled visit.